The authors examined the application of a high-ductile fiber cementitious composite (HDFC) to develop seismic-improved reinforced-concrete columns. HDFC was manufactured to show high-ductile tensile strains above 2.0%, sustaining tensile stress after cracks and developing multiple micro-cracks while avoiding crack localization. To seismically improve a reinforced-concrete column, a precast box made of HDFC was applied locally at the flexural critical region in the column plastic hinge zone; a construction process is also proposed. In seismic performance evaluations of the developed column, a series of cyclic load tests was conducted by manufacturing four column specimens. It was shown from experiments that the developed reinforced concrete and HDFC composite columns showed not only improved seismic performances but also minimized bending and shear cracks in the flexural critical region of the column. A correction to this article is available online at https://doi.org/10.1186/s40069-019-0345-0. Concrete and cementitious composites in the design of buildings have been developed, due to the increase in high-rise buildings and long-span bridges as well as interest in high-performance characteristics in other building structures. The tensile strength of concrete is much lower than its compressive strength, making it brittle and susceptible to crack development under low tensile stress. In the earthquake-resistant design of buildings, columns, as main structural members, are required to have not only high load-carrying capacities but also ductile deformation capacities for overall structural safety. 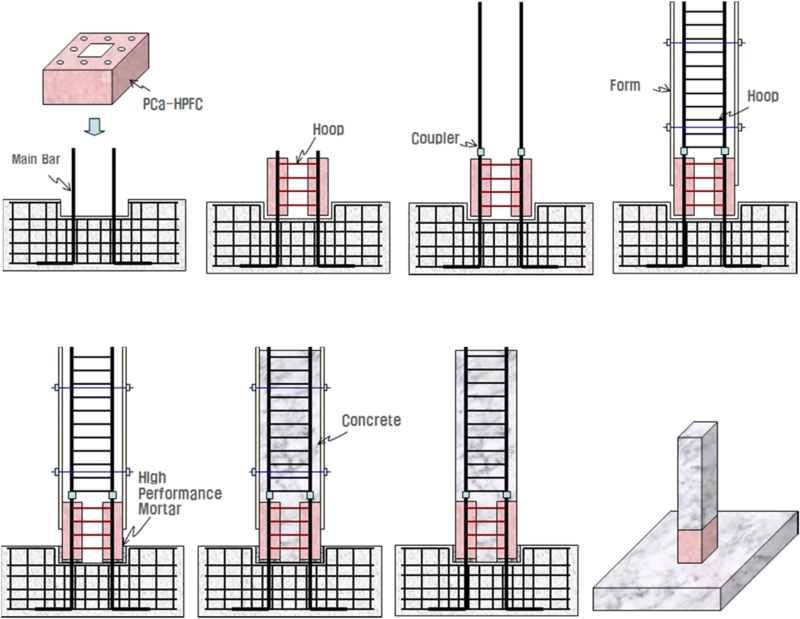 In conventional reinforced-concrete columns depicted in Fig. 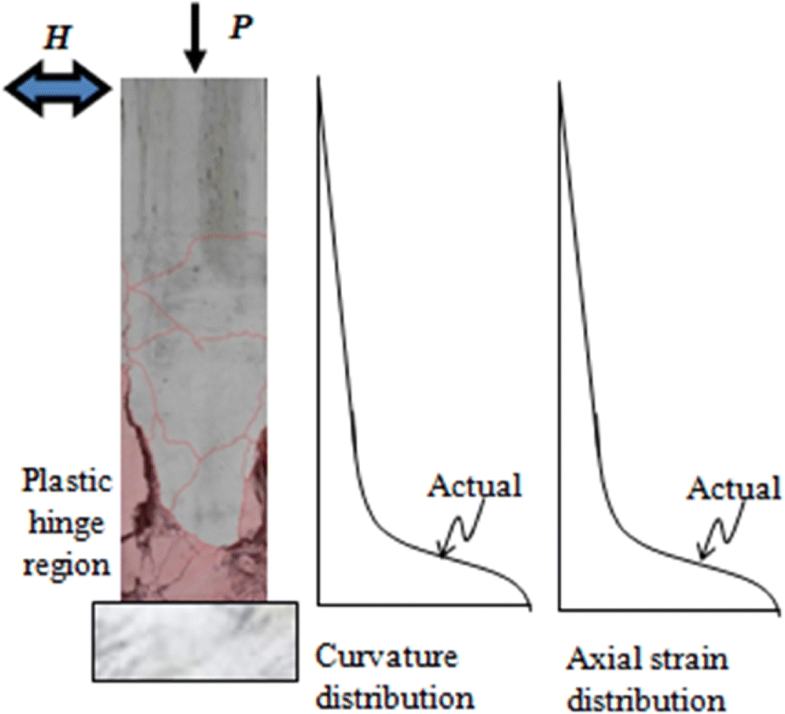 1, however, damage to the concrete and deformation of steel bars in the column plastic hinge region lead to failure caused by flexural cracks in the concrete, yielding and buckling of the longitudinal bars, and crushing of the concrete in the flexural critical zone (Chai et al. 1994; Cho et al. 2005; Paulay and Priestley 1992; Priestley et al. 1996). The use of fiber-reinforced cementitious mortar in reinforced concrete members is an economical and practical way to improve seismic strength (Li 1993; Li and Hashida 1993; Cho et al. 2008). 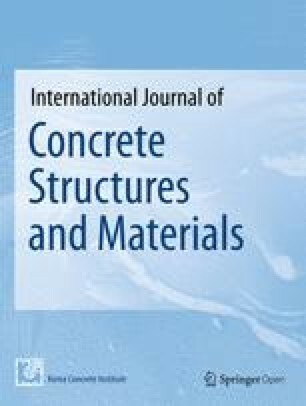 In comparison with normal concrete, fiber-reinforced concrete or high-performance fiber cementitious composites improve tensile and flexural strength, crack control performance, ductility, and shear strength (Kanda and Li 1998; Lee et al. 2012; Lin and Li 1997). The shortcoming of brittleness in concrete can be improved by adding ductile characteristics by applying fibers mixed into cementitious mortar, also referred to as high-ductile fiber cementitious composites (HDFCs). In the current research, seismic-strengthened reinforced concrete and composite columns were developed by applying a precast HDFC box in the column plastic hinge region. The precast HDFC box in the flexural critical region was intended to provide relatively improved lateral deformation and load-carrying capacities of the columns. A practical construction process for the developed column is also presented as a half precast column method. To evaluate seismic performance, four column specimens were manufactured and tested under cyclic loads. Under tension, HDFC has the advantage that localized cracks can be minimized but multiple micro cracks are distributed widely so that overall flexural and shear strength could be improved with an increase in ductile deformation capacity. The HDFC was manufactured by mixing polyvinyl alcohol (PVA) fibers, ordinary Portland cement (OPC), fine aggregates (maximum grain size: 0.25 mm), water, a high-range water-reducing admixture, and admixtures to enhance the fresh properties of the mortar (Cho et al. 2008). To achieve fluidity of the cement and the dispersibility of fibers, a polycarboxylate superplasticizer (PCSP) was applied, while hydroxypropyl methylcellulose (HPMC) was added to avoid material segregation, such as silica, fly ash (FA), blast-furnace slag (BFS) fine powder, and fibers; an antifoaming agent was added to finish the surface and control the air content (Cho et al. 2008). PVA fibers (length: 12 mm; tensile strength: 1600 MPa), surface-treated with an oiling agent (Table 1), were used as reinforcing materials in HDFC to improve the brittle nature of the binder and provide a high-ductile tensile strain, above 2.0%. The HDFC was mixed with a water/binder ratio (W/B) of 45%, a sand/cement ratio (S/C) of 71%, and a PVA fiber volume fraction of 1.5% (Cho et al. 2008). Physical properties of the PVA fiber. A direct uniaxial tensile test was conducted to investigate the tensile strain of the hardened HDFC, as shown in Fig. 2. The tensile test used a 10-kN capacity universal testing machine (UTM) with control of the displacement at 0.2 m/min. Two linear vertical displacement transducers (LVDTs) were attached to the sides of the specimens to obtain the tensile strains from the measured displacements. The specimens for tensile tests were made with a dog-bone shape (Lee et al. 2012). The hardened HDFC specimens were removed from the mold after 1 day and were cured in water for 28 days. The specimen had a cross-sectional dimension of 36 mm × 20 mm and a length of 350 mm. From the tensile test, the direct tensile behavior of the HDFC was measured. As depicted in Fig. 3, the HDFC showed a high-ductile performance after reaching tensile cracking, with a measured tensile strain of ~ 3.0%. The high-ductile tensile characteristics were due to multiple micro cracks (see Fig. 2). 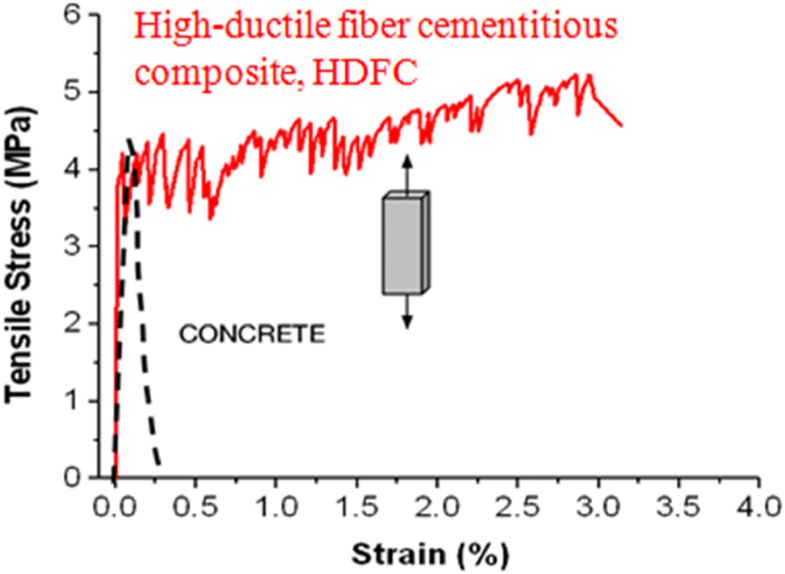 Tensile stress–strain response of high-ductile fiber cementitious composite (HDFC). After cracking, the specimen showed strain-hardening behavior and clear ductility with multiple cracking. The premature cracking strength was ~ 4 MPa, while the maximum tensile strength measured in the interval of the curing behavior was 5.0 MPa. 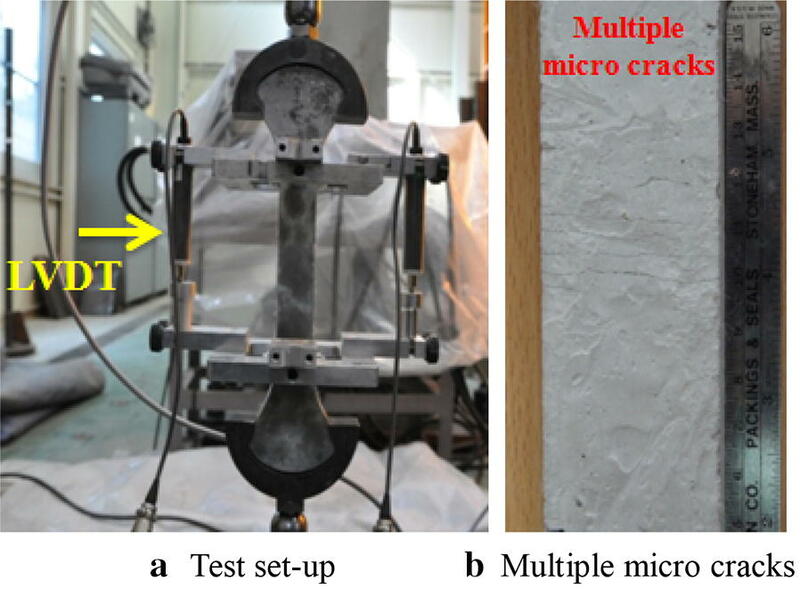 The experimental results explained why the HDFC showed high-ductile tensile strain with multiple micro cracks, avoiding crack localization, thus enhancing the brittleness of the concrete. To enhance the seismic performance of conventional reinforced concrete columns, a new strengthening method was proposed, whereby a reinforced concrete column section in the length of the plastic hinge zone was designed and manufactured as a precast HDFC box, instead of concrete. The mixing and mechanical properties of the precast HDFC box were as explained in the previous chapter. Because with mixing and placing of a HDFC in a real construction site, it would be hard to achieve sufficiently good-quality fiber dispersion, high ductility, and durability, the HDFC box was made by precasting it with wet curing. The manufacturing process and descriptions of the precast HDFC box are presented in Fig. 4. The HDFC box was designed to have transverse reinforcements and lead holes. The lead holes, to be transpierced by the main reinforcing bars, were made using vinyl tubes in the process of formwork. After 7 days of curing of the HDFC box, the formwork and vinyl tube were removed. At the placing stage of topping concrete, the lead holes would be filled with non-shrink mortar after the main reinforcing bars transpierce it, and the inside of the HDFC box filled with concrete. Precasting process for the HDFC box. 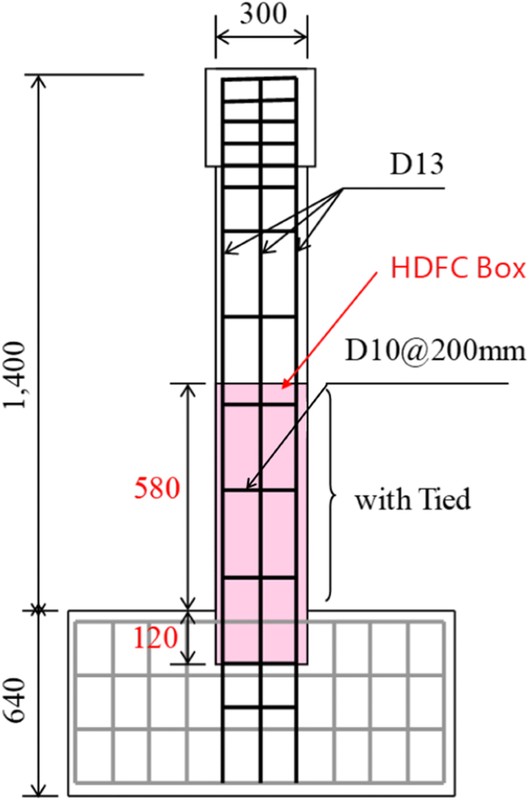 Using a precast HDFC box, a half precast composite column method is proposed, as shown in Fig. 5. It is considered that this column method can be applied in the first story or in the basement, directly connected with footings. Construction stage of the proposed column. There are three main processes in manufacturing the proposed column at the structural construction stage. First, the reinforced concrete footing is cast with assembly of the reinforcing bars and placing of concrete. The footing surface at the location of the column is cast as a rectangular column seat, with a lower height of 120 mm, to inset the precast HDFC box. The main reinforcing bars are lengthened from inside the footing. Second, a precast HDFC box is put down along the main reinforcing bars, which will transpierce the lead holes in the HDFC box. The HDFC box is inset ~ 120 mm into the column seat on the footing surface. After locating the HDFC box on the footing, the gaps between the footing surface and the HDFC box, as well as the gaps of the lead holes and the main reinforcing bars, are injected with non-shrink mortar to gain sufficient integrity between the HDFC box and the footing. Third, to place topping concrete, the main reinforcing bars are extended with bar couplers. Hoop reinforcing bars are assembled, the formworks for topping concrete are installed, and the concrete is poured. Finally, the half precast HDFC and reinforced concrete composite column construction is complete after curing of the topping concrete and removing the formwork. To evaluate the seismic responses of the proposed column, four column specimens were manufactured, representing first-story columns between the footing and the inflection point, with the column being fixed to a column base as a cantilever column. Two specimens were strengthened with the precast HDFC box in the column plastic hinge zone and two specimens were conventional reinforced-concrete columns. Table 2 summarizes the four specimens in terms of experimental variables, and Fig. 6 illustrates the geometry and reinforcement details of a specimen, HDFC-S.
d, the depth of cross section of column. The main variables in the experiments were the number of hoop reinforcing bars with strengthening by the precast HDFC box. Each column had a 300 × 300 mm2 cross-section, a height of 1400 mm from the base to the top of the column, a 400 × 400 mm2 cross-section of the head part of the column and the column base, which was connected to a reinforced concrete footing, measuring 900 × 900 × 700 mm3. All specimens had main longitudinal reinforcements of eight units of D13 bars. For specimen HDFC-N, the transverse reinforcements were not placed at the precast HDFC box to evaluate the control of shear cracks by HDFC, while for the other cases, the transverse reinforcements were assembled with D10 bars with a spacing of 100 mm or 200 mm. Two types of steel reinforcements produced in Korea were used in the column specimens. The yielding stresses of the reinforcing bars for the main longitudinal bars, D13, and the transverse bars, D10, were measured as 385 MPa and 383 MPa, respectively. The concrete was mixed with OPC, crushed stones with a maximum aggregate size of 20 mm, sand, and admixtures. Cylindrical specimens were cast to test the compressive strength of the concrete and the uniaxial compressive strength of the concrete was measured, on average, as 27.6 MPa. The manufacturing process of the column specimens for HDFC and reinforced concrete composite columns is shown in Fig. 7. Manufacturing process for the columns. 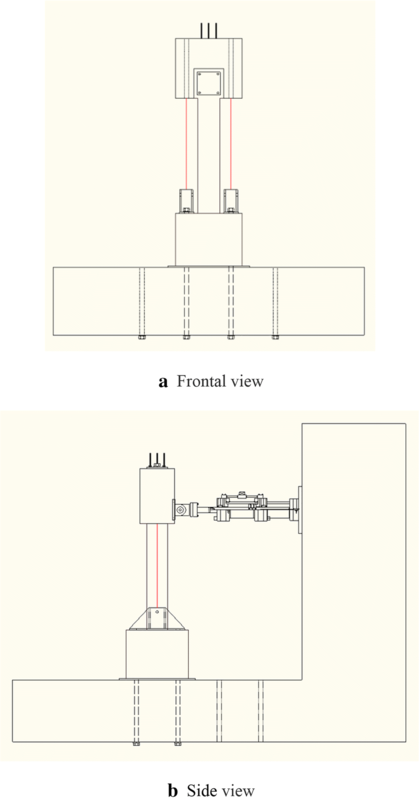 The installation of the test frame for column specimens was set up to provide cantilever-type loading conditions; as shown in Fig. 8, the bottom stub of each specimen was fixed to the base to achieve full fixation at the base (Cho et al. 2012). Lateral loading was applied through a reaction wall equipped with a 100-kN capacity actuator, according to a predetermined displacement-controlled loading sequence. Experimental setup of column specimens. The cyclic lateral load was controlled by the top displacement of the column. To apply axial loading, external steel tendons were attached between the pin and the loading frame and tensioned with hydraulic actuators. The axial load of the column was set to 196.2 kN during the loading sequence. The specimens were equipped with a displacement transducer at the top of the column to measure and control the lateral displacement of the column (Cho et al. 2012). Each specimen of the column was tested in the loading frame under a laterally reversed cyclic load combined with a constant axial load. Final failure patterns at ultimate load on the front and side surfaces are shown in Figs. 9 and 10, respectively. Cyclic lateral load and top-displacement responses of specimens are shown in Fig. 11. Failure patterns on the front surface. For the specimen of a conventional reinforced concrete column, RC-C1, the initial flexural crack occurred at a displacement of 5.9 mm, and yielding of the initial main reinforcement was reached at a displacement of 18.2 mm. The displacement of the initial yield point of the main reinforcement increased steadily with the load, up to 56.5 mm at a maximum load of 79.5 kN. 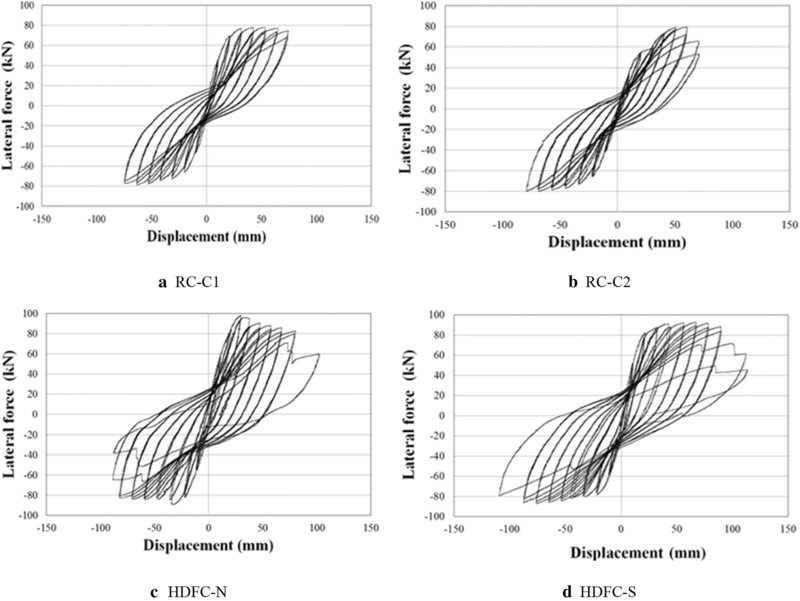 Notable tendencies in strength deterioration and stiffness degradation were observed in the specimen RC-C1; however, the load carrying capacity was limited by internal degradation in the plastic hinge regions caused by yielding of the main reinforcement at a maximum displacement of 72.4 mm (see Figs. 9 and 10). In the final cycle of loading, the load carrying capacity was so terribly dropped below 60% of the maximum load the specimen was unable to resist the axial compressive load of the column. For the specimen of another conventional reinforced concrete column, RC-C2, the initial flexural crack occurred at a displacement of 6.1 mm and yielding of the initial main reinforcement was reached at a displacement of 16.6 mm. The displacement of the initial yield point of the main reinforcement increased with the load, up to 58.4 mm at a maximum load of 78.5 kN. In comparison with specimen RC-C1, tendencies of more rapid strength deterioration and stiffness degradation in the specimen RC-C2 were observed due to the lack of transverse reinforcements. The plastic hinge regions were more extended, with severe damage to the concrete and steel bars, and the maximum lateral top displacement was measured as 68.6 mm. For the specimen HDFC-N, without transverse reinforcements in the precast HDFC box, the initial flexural crack was identified at a horizontal displacement of 4.8 mm and the load carrying capacity increased after the first crack; however, the yielding of the initial main reinforcement occurred at a horizontal displacement of 17.4 mm. The maximum load carrying capacity of 92.5 kN was reached at a horizontal displacement of 65.6 mm; maximum displacement was reached at 112.3 mm. 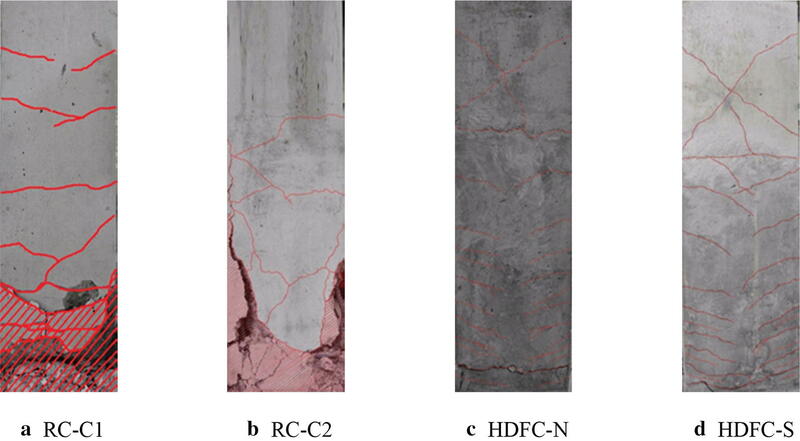 Unlike the specimens RC-C1 and RC-C2, shear cracks were not observed during the loading sequence, spalling and damage in the precast HDFC surface were not as serious, and finally the specimen reached failure with bending cracks near the column base. For specimen HDFC-S, strengthened with the precast HDFC box with transverse reinforcements in the plastic hinge region, an initial flexural crack occurred at a displacement of 5.2 mm. Yielding of the main reinforcement occurred for the first time at a horizontal displacement of 15.4 mm after showing an increase in load-carrying capacity according to the increase in displacement with definitive stiffness. The maximum load carrying capacity of 97.7 kN was reached at a horizontal displacement of 31.5 mm. The horizontal displacement was up to 77.9 mm with increasing horizontal displacement and decreasing strength. The results of the tests showed that no more load carrying capacity could be maintained due to internal degradation in the plastic hinge region caused by yielding of the main reinforcement at a maximum displacement of 101.9 mm. Shear cracks on the surface of HDFC box were not observed until the column reached failure by bending, and in the column plastic hinge zone, spalling and damage to the HDFC surface as well as buckling of the main bars were not observed, in comparison with the specimens of reinforced concrete columns. The overall responses of each specimen are summarized in Table 3. Test results for each specimen. 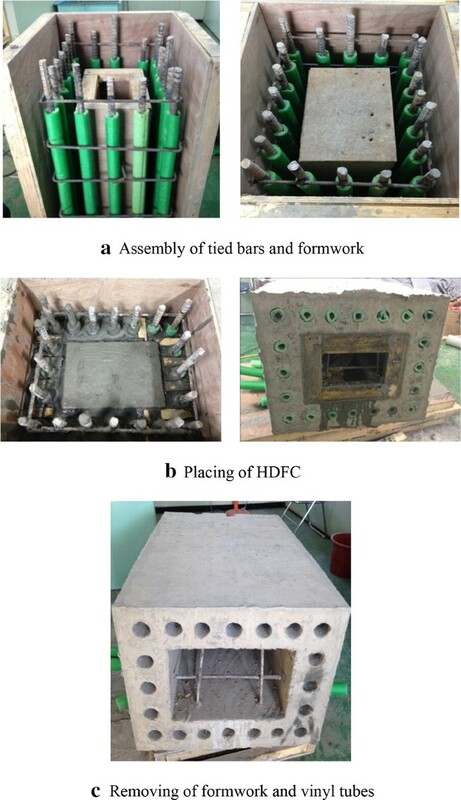 The following conclusions were reached after evaluating the cyclic loading tests on a newly developed seismic-strengthened reinforced-concrete column, applying a precast HDFC box in critical flexural regions. By specifically placing the precast HDFC box near the critical flexural region of the reinforced concrete column, the precast HDFC box could control flexural and shear crack formation, spalling and damage, buckling of the main reinforcing bars, and cover debonding in the plastic hinge region of the column. Thus, this configuration improved the flexural capacity of the column while ensuring the safety of axial loads. In comparison with specimens of conventional reinforced-concrete columns, the column specimens improved with a precast HDFC box showed enhanced responses, minimizing shear cracks and shear failures despite minimum use of transverse reinforcements as well as concentrated local damage of the column in the plastic hinge zone, induced by bending cracks, spalling of the cover, and buckling of the main reinforcing bars. 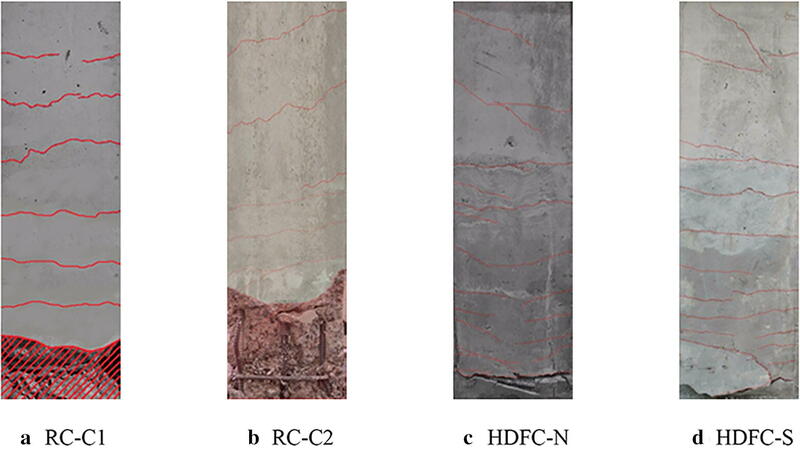 Thus, two specimens of improved columns with a precast HDFC box showed improved overall lateral load-carrying and deformation capacities under cyclic lateral loads compared with conventional reinforced-concrete column specimens. All the authors participated in developing and verifying the R/C composite columns system using a high-ductile fiber cementitious composite precast box for improving seismic performance introduced in this manuscript, and the K-SL supervised this study. While the C-GC and K-SL authors took the lead in writing of this paper, the S-HC, H-JM, and H-YK contributed significantly to revising and improving it. All authors read and approved the final manuscript. This research was supported by research funds from Chosun University (2018) and National Research Foundation of Korea Grant 2017R1A2B4008983, funded by the Ministry of Education, Korea.